This is a story of persecution and poetry, love and war set in thirteenth century southern France. A troubadour, Bertran, witnesses the brutal murder of the Pope’s legate, and risks his life to warn others of the war that he knows is certain to follow this act. The lands of the peaceable Cathars – deemed heretics – are now forfeit and under threat from crusaders who have been given authority by the Pope to take the Cathar domains by force. But the Pope is trying to track Bertran down and so is somebody else: Elinor, a young noblewoman, in love with Bertran but facing a loveless arranged marriage, flees her family and becomes a minstrel herself. Soon both Bertran and Elinor find themselves enveloped in a rising tide of bloodshed that threatens the very fabric of their society. 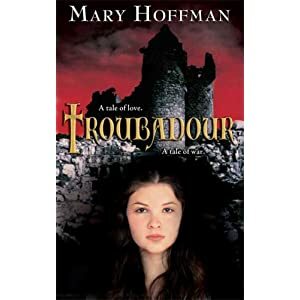 Troubadour was a richly told story told in third person, jam packed with little-known facts of France from this time period when the tumultuous Crusades were still in full swing. Although the deluge of minute details wouldn’t engage a teen reader unless they particularly love this author or this genre, I felt thoroughly educated while reading this historical novel. Elinor was a relatable character and displayed a great deal of attributes common in a modern feminist. She refused to marry the suitor her family had chosen for her and ran away disguised as a young boy in order to gain her freedom. I felt there was a lot of buildup in the ‘relationship’ of Elinor and Bertran the Troubadour, and sadly this ‘tale of love’ fell short in that department. There was no budding love between them as the dust jacket promised, only the gift of a red brooch to Elinor was the only indication of their romance. The age difference between Bertran and Elinor was a contributing factor to this dilemma, and I felt sorely disappointed when Elinor chose to marry someone she had only known for a few chapters near the end, when she pined over Bertran for ninety percent of the novel. Elinor’s husband could have been a better developed character and come earlier into the story for her choice to make more sense. The sudden switching in viewpoints mid-chapter without much indication that the narrator had changed was a bit confusing at times, causing me to backtrack to find out who exactly was speaking. But despite the novel’s shortcomings in the character and relationship development it was rich in plot and historical details. I will give Mary Hoffman a lot of credit for doing her research so carefully and painstakingly. It takes quite a dedicated author to but that much detail into a novel! It was enjoyable and I will probably read Mary Hoffman’s other works. I must admit it can be frustrating when a character goes off with the wrong man, especially if the romantic tension has been building over most of the book. But glad to hear it was otherwise well written. I might have a look into this one. worst book in the world. I would prefer to stab myself in the eye ten times then read it again.